CLASSIC Continue your Sightseeing Tour to the Angkor temples at Ta Prohm. Tree roots cover the ruin walls, allowing you to experience the temple with the same wonder as early explorers. Then visit Banteay Srei, a unique temple built on a small scale from red sandstone, which can be carved like wood. En route, stop at a village famous for making Khmer noodles by hand. DISCOVERY Your Guided Sightseeing starts in Kampong Tralach with an Ox Cart Ride through the beautiful Cambodian countryside. Along the way, stop to meet a local farmer and learn about his daily life. At the silversmith village in Konpong Louang, see talented craftsmen use age-old techniques to turn pure silver into works of art. This inspiring river cruise vacation begins in vibrant Bangkok, Thailand. A boat ride on the klongs, Bangkok’s famous canals, is the perfect way to start your sightseeing. Continue at the Grand Palace featuring the Temple of the Emerald Buddha followed by the Temple of the Reclining Buddha—the oldest and largest Buddhist temple in the city. Fly to Siem Reap, Cambodia, where you’ll see the magnificent Temples of Angkor, such as Angkor Wat and the Bayon temple, featuring some 200 mysterious faces carved in its many towers. Next, board your ship and begin your cruise along the mighty Mekong River. Visit the capital city of Phnom Penh, with the magnificent Royal Palace featuring its striking Silver Pagoda and the National Museum. Take in the stunning views at the 8th-century temple of Wat Hanchey before walking through the rural village of Angkor Ban to visit with welcoming schoolchildren. Continue your cruise into Vietnam and stop in the villages for interactions with locals, such as a visit to the home of a skilled family who make handcrafted sampans for a living. Go on an excursion to the Cu Chi Tunnels, the unbelievable network of tunnels used extensively during the war. In exciting Ho Chi Minh City, enjoy a walking tour of the famous landmarks and try your hand in the kitchen with a Vietnamese cooking class. Disembark your cruise ship and fly to Hanoi, where you’ll explore the famous Old Quarter with peddlers trading goods among its 36 ancient streets. From here, travel to Ha Long Bay with its more than 3,000 limestone islands of varying shapes. Enjoy a 2-night cruise along the bay with visits to the Cua Van Floating Village and fascinating caves. Hue, a former capital of Vietnam, remains an important cultural mecca. Here, you’ll see the imposing Imperial Citadel and Thien Mu Pagoda—the unofficial symbol of the city. In Danang, you’ll visit the Cham Museum and explore Hoi An Ancient Town, a UNESCO World Heritage Site. The beautiful scenery, ornate temples, and interactions with locals make this Southeast Asia river cruise vacation one you won’t soon forget! Participation in this vacation requires purchase of the following flights from Avalon Waterways, not included in pricing: (1) roundtrip air from your U.S. gateway and intra-vacation air segments; or (2) intra-vacation air segments only, starting at $740. 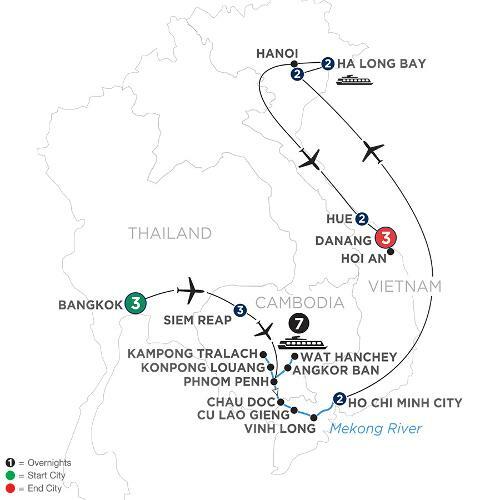 Required intra-vacation air segments: Bangkok/Siem Reap; Siem Reap/Phnom Penh; Ho Chi Minh City/Hanoi; Hanoi/Hue. Air prices were effective on February 6, 2019 and their availability is limited. At the time you purchase your tour, air prices may be higher.